Looking Back. It is at this time every year that many of us reflect on the events of the past year. The things we have done. The tasks we failed to complete. And the goals we resolve to accomplish in the New Year. As I reflect back on the achievements of 2011, I am truly humbled by the how fast an idea can grow when it's nourished with passion, watered with determination and tended with faith. 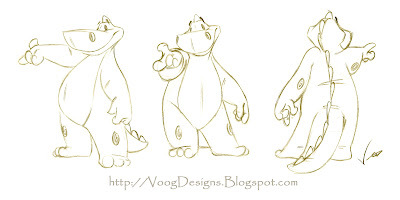 VoogDesigns was a seed that was planted inside of me over 15 years ago, but it took that time and the experiences during those years to allow the roots to take hold so that he stalk could finally reveal itself through the soil. Another beautiful metaphor is a rear view mirror, which was used in the church bulletin that I also contribute a comic strip to every week found on Page 9. Enjoy this special New Years Eve comic strip, and unlike the dad character, let us not be too eager to ring in the New Year without taking the time to reflect on the knowledge and experiences we have gained throughout 2011, to provide us with the wisdom for a meaningful and blessed 2012. 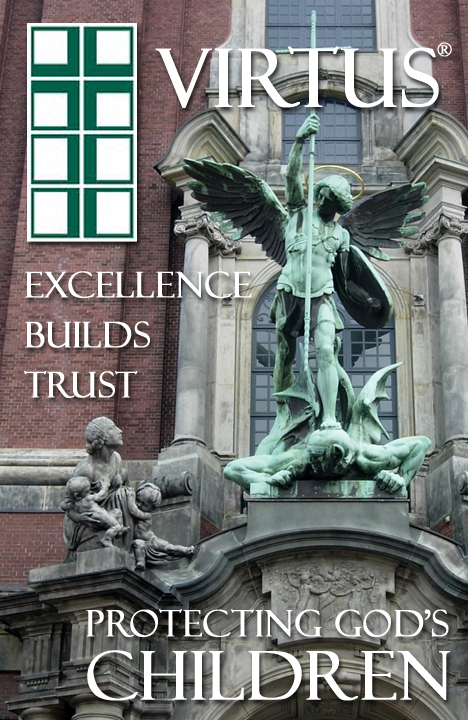 To our past, present and future clients, it is with much gratitude that I thank you for the opportunity to serve you on this wonderful journey and pursue my dreams. Gifts. With the beginning of the Christmas Season upon us, I wanted to encourage nurturing the unique gifts we all are blessed with. Last month a tragedy struck our family when we discovered that a young family member had unexpectedly lost his mother. 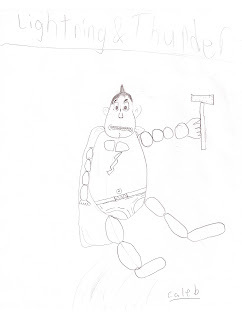 After speaking with him during Thanksgiving, I realized that this young boy loves to draw, and he created for me this wonderful and imaginative piece of artwork. As kids we all have dreams. Dreams of what we'll be when we grow up. Dreams of what we will do and places we'll go. And our dreams usually have something to do with the gifts and talents we are blessed with. When you see these gifts in others, encourage them rather than tear them down. And I choose to live by "The Optimists Creed". Protect and Serve. Two powerful words that remind me to remain honorable and humble.Those who know me may recall a time in my life in which I pursued a career in law enforcement. Last night I had the benefit of receiving an eye-opening education on an important subject matter that unfortunately, is very dark and disturbing. However, it's what you choose to do with the knowledge that makes the difference. 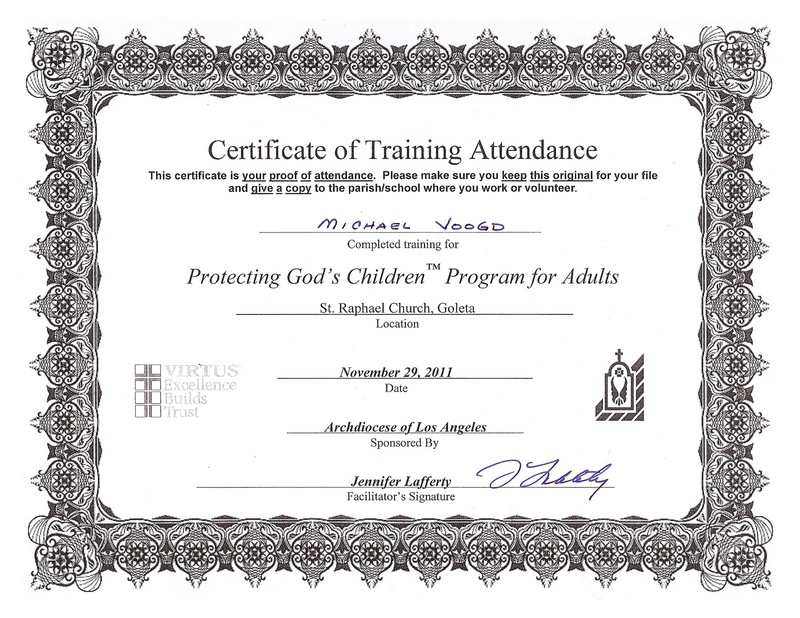 Last night I attended the VIRTUS Certification Training to assist parents, teachers, volunteers and anyone working with children, to be aware of what we can do individually and collectively, to protect God's children. 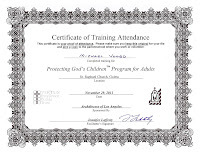 After receiving this certification of training, I choose to use the information in a proactive approach, openly communicating with my students and their parents. Step 1: Know the Warning Signs- If we know the warning signs, then we can identify potential situations before they happen and do not have to rely on a child to report an incident. Step 2: Control Access- Controlling access means that we are careful about whom we allow to work with our children. Step 3: Monitor all Programs- Our classes are held in areas where other adults can always pass by, and we encourage parents to view and monitor our classes at any time. Step 4: Be Aware- When we observe and communicate with our children, we are more likely to detect any subtle signs of a problem. Step 5: Communicate Your Concerns- We advocate and encourage open communication with our students and their parents. Only by communicating our concerns can we use our knowledge to protect children. If you are a parent, teacher, volunteer or an adult that is working with children, I would highly recommend that you participate in this education. There is no charge to attend this 3-hour session, and the knowledge you gain will give you the tools that may prevent another tragedy. Thank you for the opportunity to serve you, and help protect God's children. 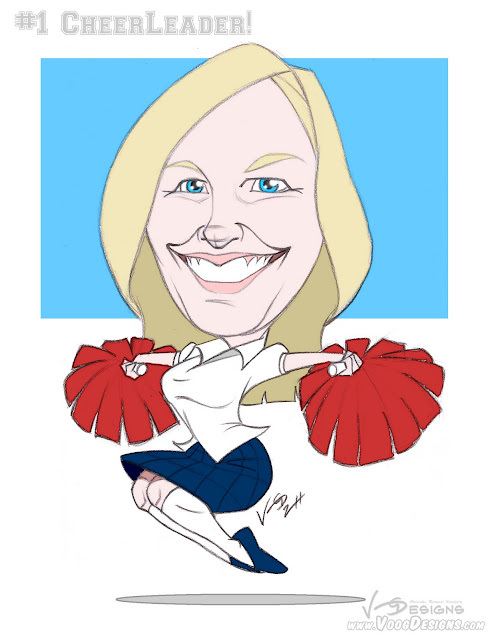 There are many "schools of thought" about improving our educational system today. However, integrating the arts into core academic subjects was the focus of a free workshop this week hosted by the department of teacher education at California Lutheran University in Thousand Oaks. Below is an excerpt from the article in our local paper, Teachers Learn the Art Way, about the importance of art and the benefits they have on student learning. "Because it's all about the scores, they want you to just work on the standardized tests and core subjects. Now they're realizing you have to stimulate both sides of the brain, and they're learning that arts draws out dialogue from children and helps improve their reading, writing and critical thinking skills, so it's so exciting to have your craft promoted in the field." It's not everyday that you get to see, have access to, and visit with some of the greatest artists in the comic book and animation industry. It is a dream come true! So How did I get this wonderful opportunity? The direct answer is by taking a shot. 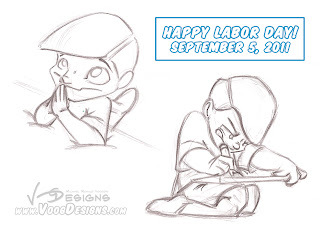 Back on September 27, 2011, I attended a special lecture held by Animation Nation. I invited a few friends with me and together listened to an industry veteran speak for a few hours to a crowd of over 200 other aspiring animators. Afterward, most of the attendees rushed the stage to ask for autographs. The next day I e-mailed the speaker inviting him to a cup of coffee so I could ask him questions that time did not allow the night before. He responded and accepted. This started a chain of events that not only created a new friendship, but ultimately provided me the opportunity to partner with him on a special project, and be his special guest at this year's CTN Animation Expo. With heartfelt gratitude may I say, "Thank You." Make Their Day. It might be as simple as saying thank you, or telling a customer, from your heart, how much you appreciate the opportunity to serve them. It moves past just being civil or pleasant—it’s taking that extra step you didn't have to take. And that makes all the difference. Spontaneous or planned, when you make the effort to brighten someone’s day—not because you want a reward, but because that’s the person you want to be—you receive an internal gift that makes life even more meaningful as well. No matter what, making someone’s day is a win-win. Every single time. 1. Not moving or flowing; motionless. Baby Books. It wasn't too long ago that I had this grand idea to not just have pictures in my daughter's baby book, but actually also drawings of her life as she was growing up. That was over 10 years ago and I have a lot of catching up to do! Now I have an opportunity to share that idea with others. 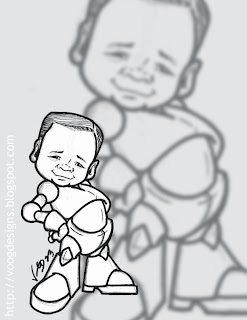 Below was a fun project I was asked to do for a client's grandchild who happens to be turning 1 year old next week. Happy Birthday Ciara! There is nothing quite like the sound of laughter from a child. Now multiply that by 10 and what a symphony! 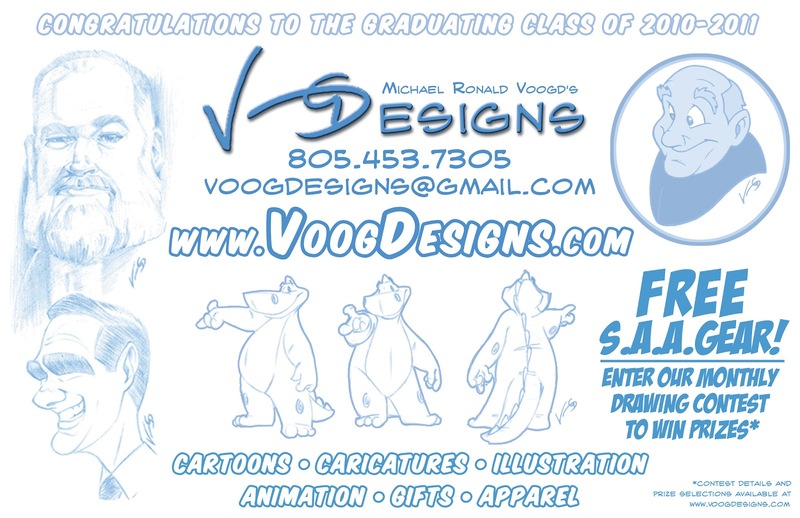 Last weekend marked the first VoogDesigns Birthday Party Celebration. Entertaining over a dozen kids, with games, activities, and of course a drawing lesson, watch the slide show below and we'll let you decide if you think the kids had a good time, or a great time! Ready to plan your child's unique and memorable birthday celebration? CLICK HERE. I believe that the gifts we are blessed with are meant to be shared. 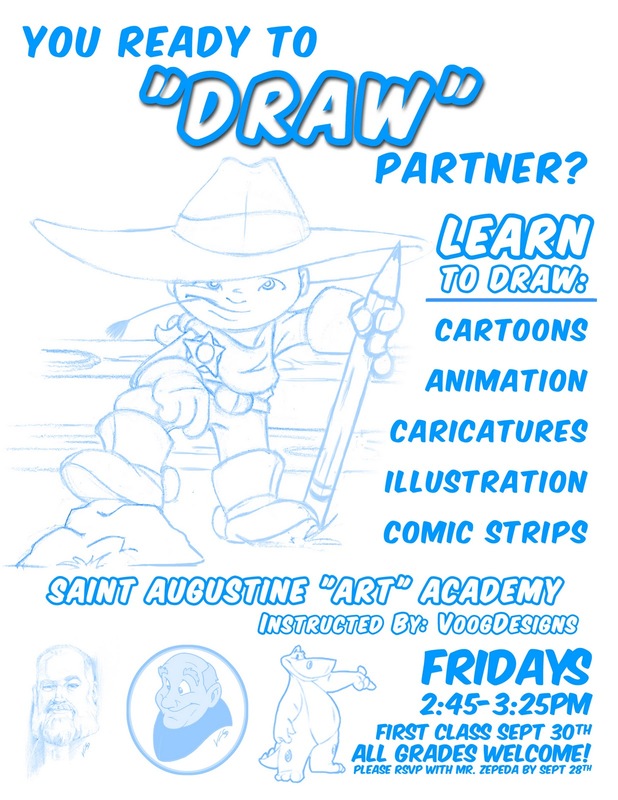 Beginning on September 30th, VoogDesigns will be volunteering their time every Friday at Saint Augustine Academy in Ventura, CA to offer a 45 minute class that will explore the following subjects to students of all grade levels that are interested in: Cartoons, Animation, Caricatures, Illustration and Comic Strips. His name is Rafael and at 75 years of age he is old but has a young spirit, a good example for us all. He has a passion for hiking, Mexico, and world travel. 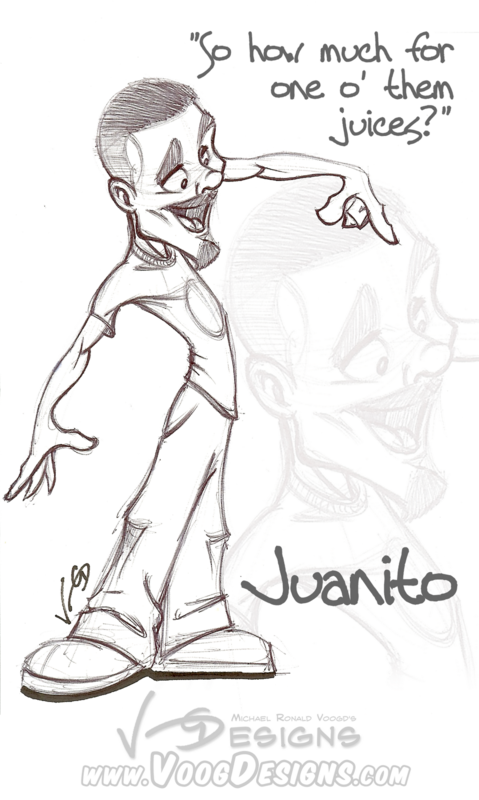 As you can see, he has a good face for a caricature. And if the comb-over (hair) fits into it, all the better. 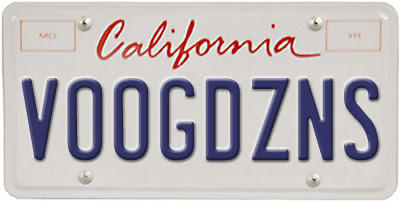 (It has humored me for years but he just wouldn't be the same without it.) I forgot to mention that he always, always, always wears a dress shirt, tie, dark pants and suspenders. Always. Thank you so much! 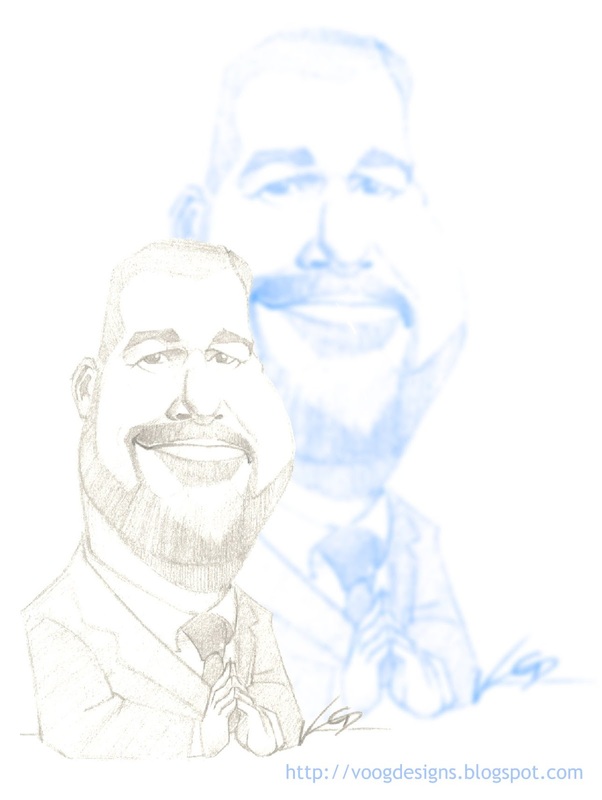 We were honored to create this very personal piece of artwork for a man that will remain forever young. Thank you for the opportunity to serve you. 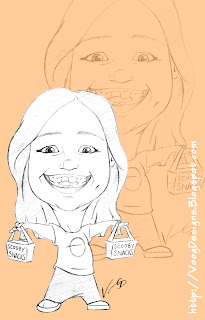 Recently VoogDesigns was asked to create an Oktoberfest Invitation featuring caricatures of the two hosts. So we wanted to take you through the process of how this invitation was created. Enjoy! Is it really "work" if you love what you do? This is a question I've placed under our contact information which you'll find to the right of this post. 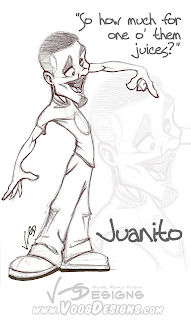 You see, ever since I was a kid I have always loved to draw. But in the Summer of 1988, it became my vocation. Through prayer and perseverance VoogDesigns is my vocation. I believe we are all blessed with unique talents and abilities, and I have been called to be an artist. So if you love what you do, is it really work? Rather it is a Labor of Love. Occasionally, I get the privilege of picking up my daughter and a hand full of other students from their school in a weekly van pool. 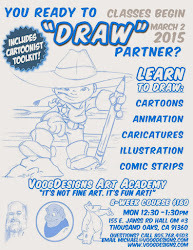 Well, VoogDesigns has taken this opportunity to create "CarToon Classes". Every week these young and talented passengers can take advantage of the 20-25 ride home and participate in a new lesson on how to draw and create their favorite animated characters. Not in the van pool? Not to worry! 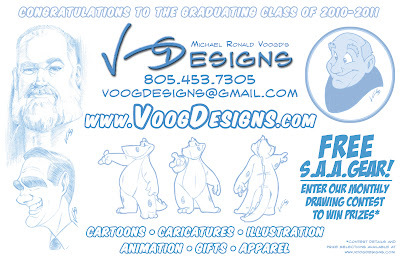 These lessons will soon be available for anyone wishing to strengthen their drawing skills by enrolling in VoogDesigns Drawing Classes where you will learn the fundamentals of drawing and animating your own cartoons. Daydreaming. \ˈdā-ˌdrēm-,ing\ A visionary fantasy, especially one of happy, pleasant thoughts, hopes or ambitions, imagined as coming to pass, and experienced while awake. For many, daydreaming is a temporary escape from reality. But for creatives, any blank canvas (even Latex gloves) gives us an opportunity to act on those visions. 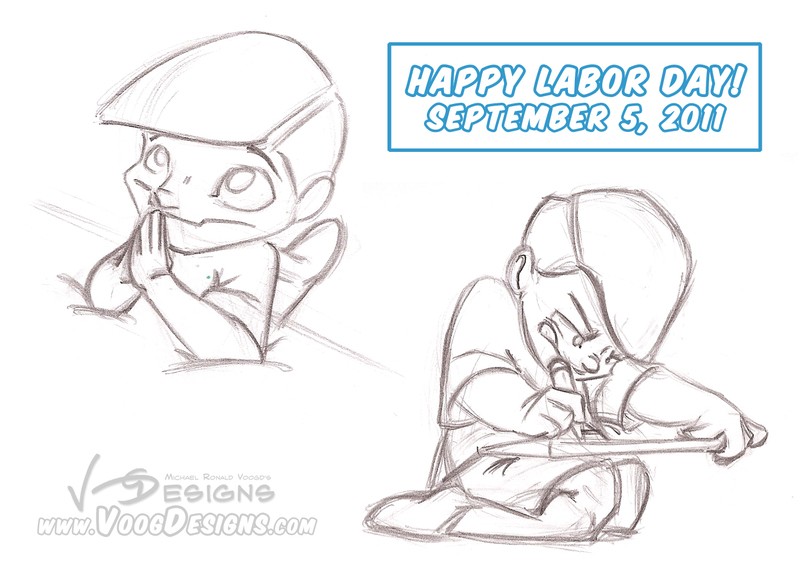 And then DayDreaming becomes "DayDoodling"! Patience. It's hard enough mastering this characteristic as an adult, but imagine being a 12-year old kid that has to accept this quality before being able to see his work of art come "alive"! 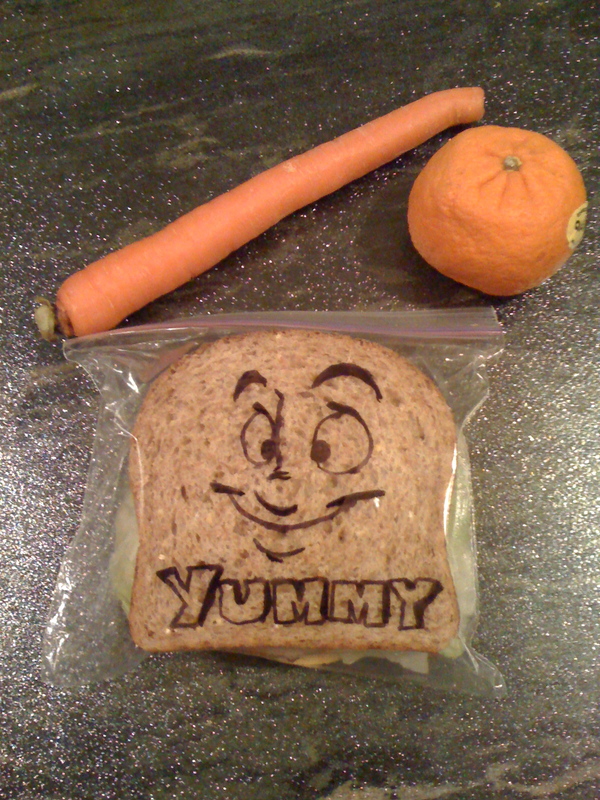 Meet Zachary M., also known as "MiniClayDude". During my recent visit for a "most special" project, I discovered that we both share the same love- ANIMATION. 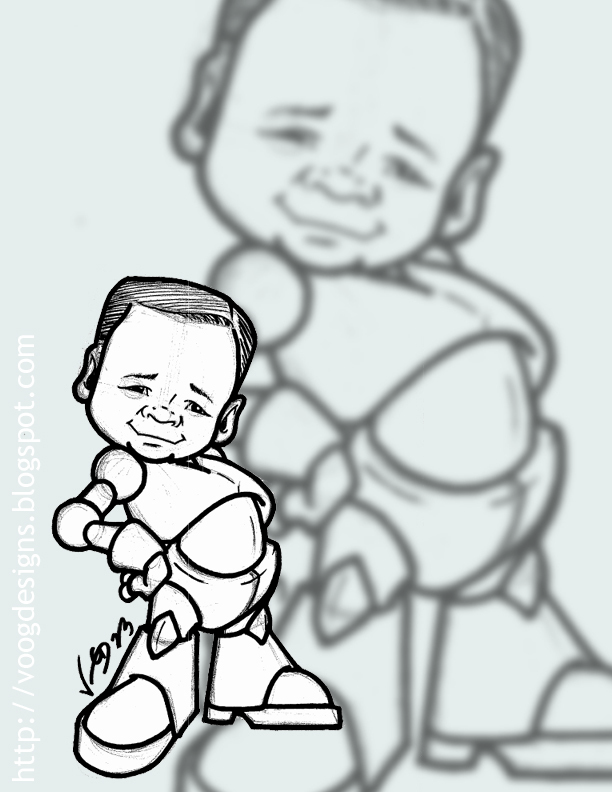 I was about Zachary's age when I knew that bringing drawings to life was what I wanted to do too. So I took the opportunity to ask "MiniClayDude" a few questions about his love for Claymation Creations. What interested you in doing claymation rather than painting or drawing? I got into claymation a long time ago (like 2 years ago). I saw a guy on you tube named Mamshmam who did amazing claymations and I guess I followed that. It's a lot of work making movies.Why do you do it? How does it make you feel? The way I do it is simple. I just take a picture and move the guy. Take a picture and move the guy (and so on). It's also because I have patience. They make me feel happy and excited to watch them at the end! How many pictures (frames) to you take for an average movie? For an average movie I take more than 200 or 300 pictures. What kind of reaction have you received from family, friends and fans of your movies? The reaction from my family, friend, and fans is really good. They encourage me to make more movies. What's can we expect next from "MiniClayDude"? What can you expect from MiniClayDude next? . . . Heck, I have a whole 2 pages full of ideas from ninja fights to water balloon fights! 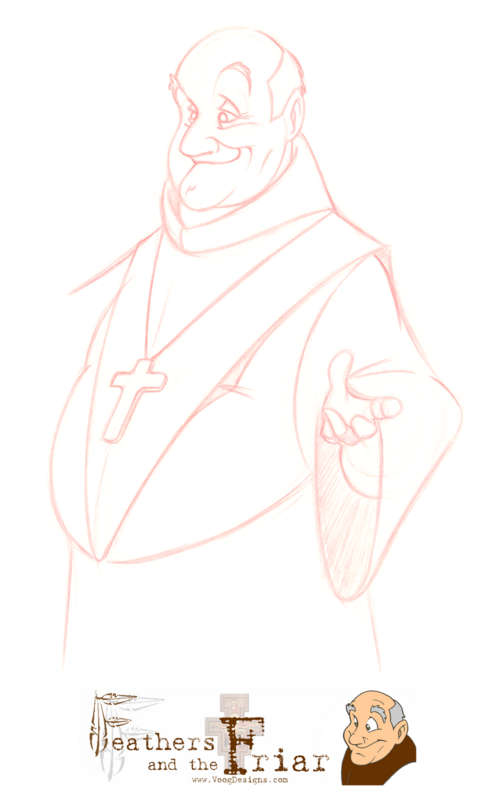 My plans for the future are being a priest. 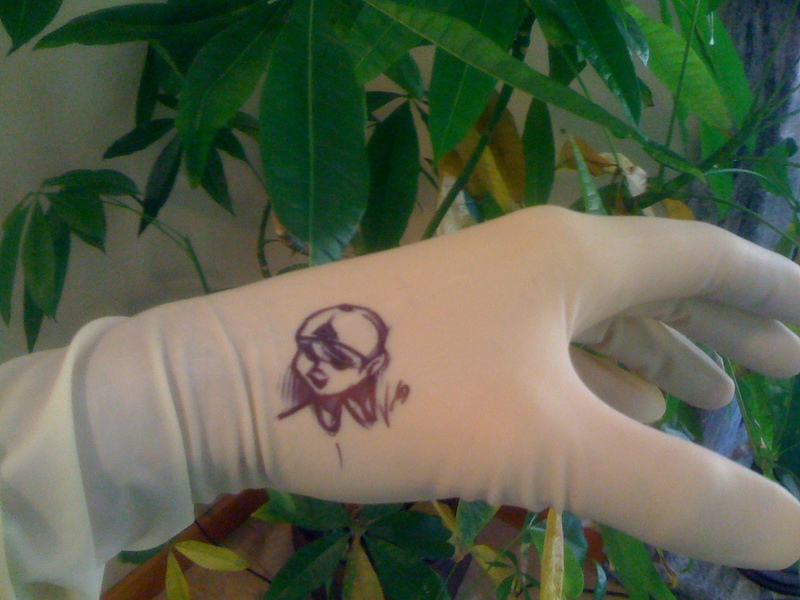 Or if God is not calling me for that, then I will become a. . . doctor or something like a claymationist. Thanks Zachary and continue to explore your God-given talents! 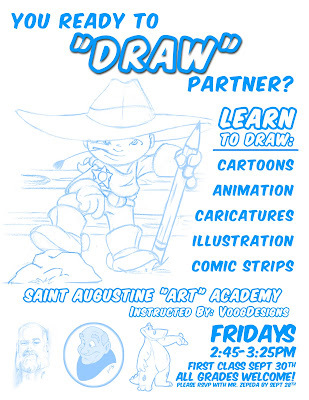 Discover the secrets of how to draw a classic Disney character from a Disney animator at Animation Academy! I found out about this recently after a good friend of mine had the privilege of attending this hands-on experience when he chaperoned a year-end field trip for his children' class to Disney California Adventure Park. The last time I attended something this cool was back in 1988 at the Disney MGM Studios in Orlando, FL! I can't believe I didn't know about this! 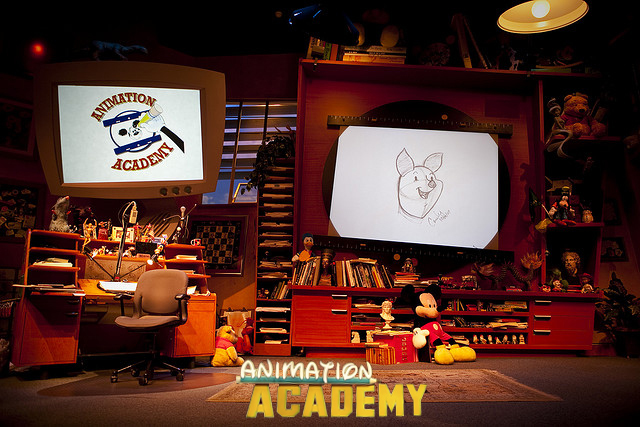 Fun for any age and experience level, Animation Academy provides step-by-step instruction on how to draw some of your favorite Disney characters. 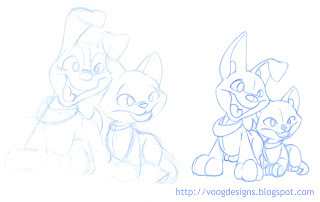 Learn some basic tricks and techniques to give your drawing a professional pedigree. Animation Academy is only one part of the Disney Animation building, where you can learn all about the art and history of Disney animation, in an interactive, hands-on environment. Tools. There are many standard and some very unique tools that artists can utilize to craft their creations. Fifteen years ago, as I was applying to Disney, DreamWorks and Warner Bros. 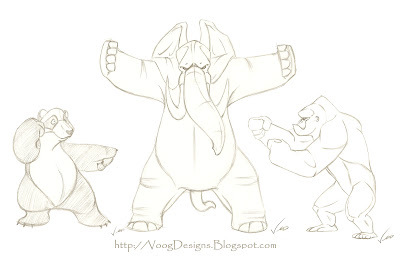 Animation Studios, a new technology was changing the way animated features were being produced. Today's artists must not only be craftsmen, but also need to stay current with the technology of their trade. This was apparent to me during my tour of the DreamWorks Animaiton Studios in Glendale, CA. Paper has now been replaced by the Wacom Cintiq 21UX. Unfortunately, they retail for $1,999! 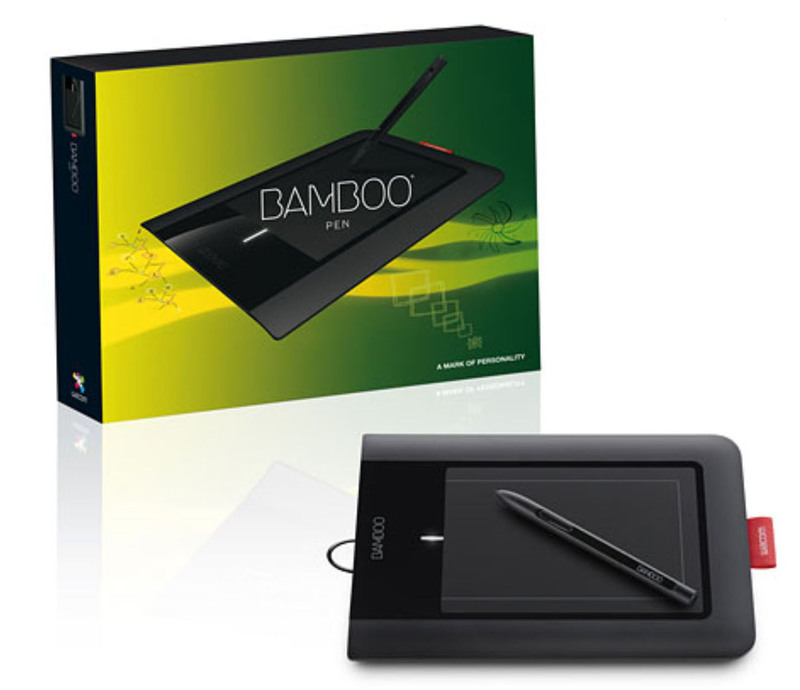 Luckily, there is a more economical option with the Wacom Bamboo. Today I purchased my first tablet in order to adapt to this new world of technological tools. I admit that I have always been a little apprehensive about using these tablets. But with anything, practice is essential to get the user comfortable and confident with their new found skills and abilities. In the summer of 1988 my family embarked on a road trip around the United States to see as many landmarks as possible in a 1 month period. Little did I know what I would find on this journey. 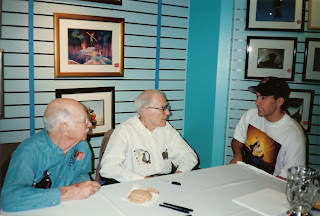 At 13 years old I already had a fondness of animation, but it was at the newly constructed Disney MGM Studios in Orlando, Florida that I knew what I wanted to do. The picture above is of the actual case of Disney Animator's Drawing Paper that I purchased on that special trip in 1988. I found this paper tucked away in a file cabinet containing some of my old artwork. 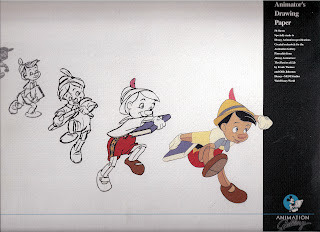 The caption on the right states, "Animator's Drawing Paper- 50 sheets specially made to Disney Animation specifications. 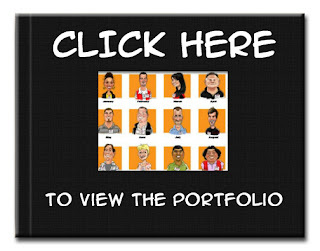 Created exclusively for the Animation Gallery." 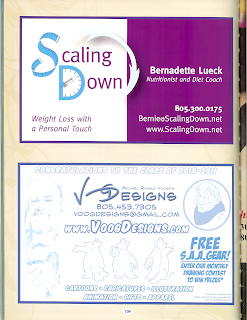 If you are going to pay for your license and registration, why not build in some mobile marketing too! "Dad, when you were a kid, what was your favorite ________ ?" Well, tonight I gave my daughter the answer to the question, "What were my favorite cartoons when I was a kid." We sat down in front of our computer and after hearing theme songs of Saturday mornings past and viewing iconic images of my boyhood, one cartoon stood out from all the others. Listen to the energetic theme song as the crisp action is perfectly timed to the beat. Look for the strong and dramatic anatomical poses during each character's introduction and a collage of the cast so nicely composed within the television frame. And finally the harmonious pacing of quick and slow movements, camera angles and perspectives. The childhood cartoon that I deemed my favorite was, ThunderCats! Last night VoogDesigns welcomed a very special guest to the studio. 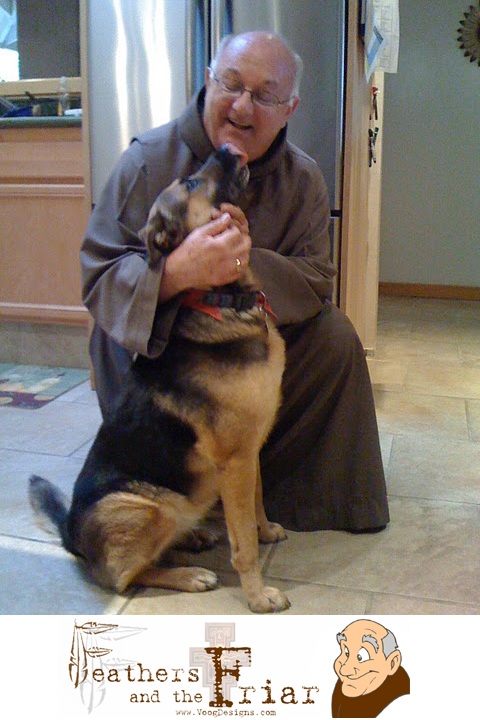 This Happy, Humble and Holy guest was so special in fact, that he was able to tame our vicious attack dog like St. Francis of Assisi subdued the Wolf of Gubbio! 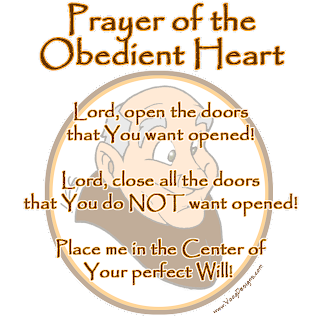 Thank you Friar Joe Scerbo for blessing our home with your warm company. Multitasking. 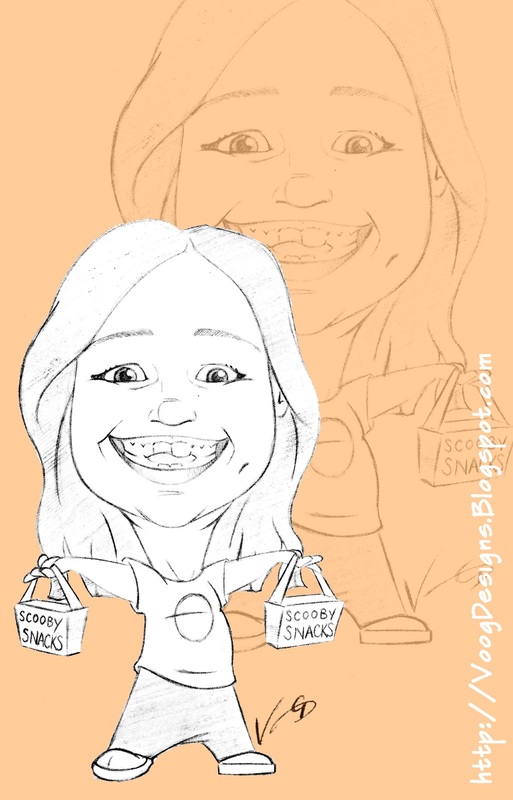 We've all heard the phrase "walk and chew gum" or "walk and talk", but can you "jaw and draw" like this legend? Notice that there is NO ERASER on his pencil. The strokes are felt before he even puts them to paper. I love watching how others draw. What is their thought process? Where do they start? And this short video puts you into the mind of a legendary animator that had the privilege of being mentored by the original "9". Enjoy! 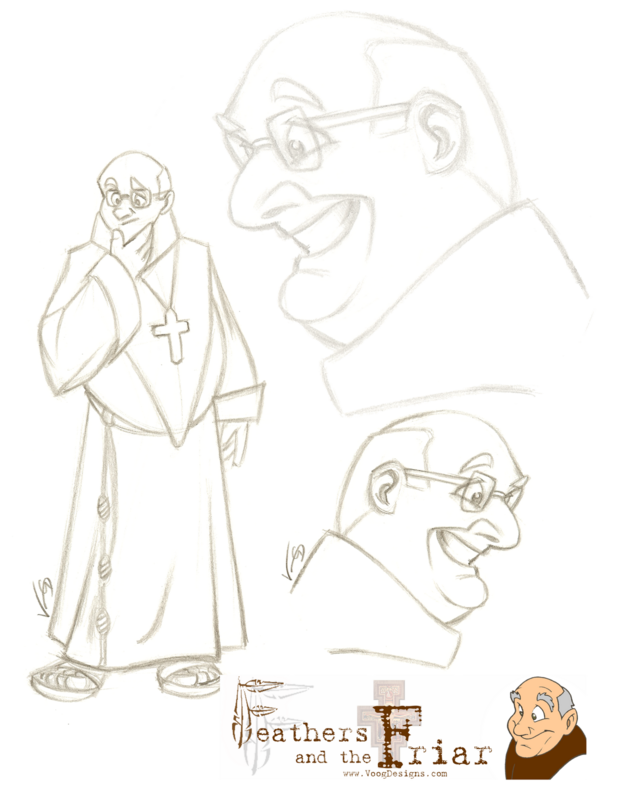 An exciting book project that VoogDesigns has recently been assigned to takes the reader through the travels of a St. Francis Friar. 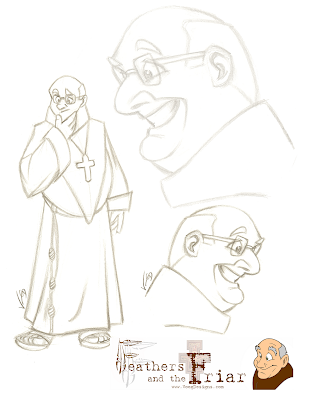 Without releasing too much yet, here is a look at some designs showing various expressions of the main character. Back in 1995, I had the opportunity to meet two living legends in animation. I knew I had pictures of this meeting, but after multiple moves and too many boxes, I feared that I had lost the "proof". It wasn't until recently when I was setting up VoogDesignStudios that these pictures were uncovered. 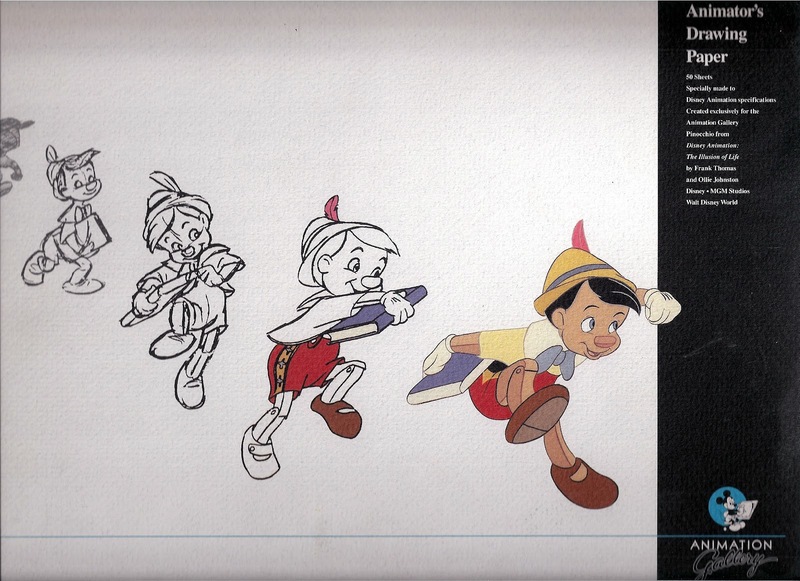 Hidden within the dustcover of Disney Animation: The Illusion of Life were these photos that dropped into my lap. 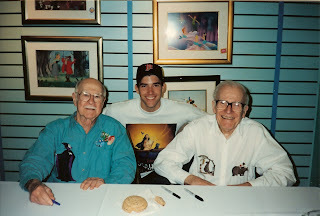 My visit with Frank and Ollie back in 1995. A picture to be framed and matted at VoogDesigns. Special thanks to Jim Wilber. Never meeting Jim before, he was another attendee at this event who had the foresight to bring a camera with him. He was kind enough to snap these pictures and mail them to me after the event. If it weren't for Jim, these pictures never would have made it to these pages. Thank you Jim! ... and some fun items that remind you to take time to eat! For those of you who don't know who Mike Kunkel is, let me be one of many fans that would like to introduce him to you. 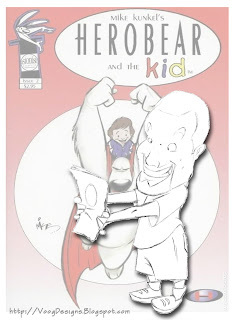 I had the priviledge of studying under Mike while he was still working on his soon to be released hit Herobear and the Kid. Knowing what was to come from his labor of love, I sketched this caricature of Mike viewing his creation hot off the presses. As I look back though my old sketchbooks, I often find fun surprises. It's difficult to remember every drawing you have ever done, which is why it is so important to keep and preserve your sketchbooks. Not only will they bring a smile to your face, but they're also a Time Capsule to wonderful periods in your life. This young girl that I once saw so often has now grown up to be a lovely woman. 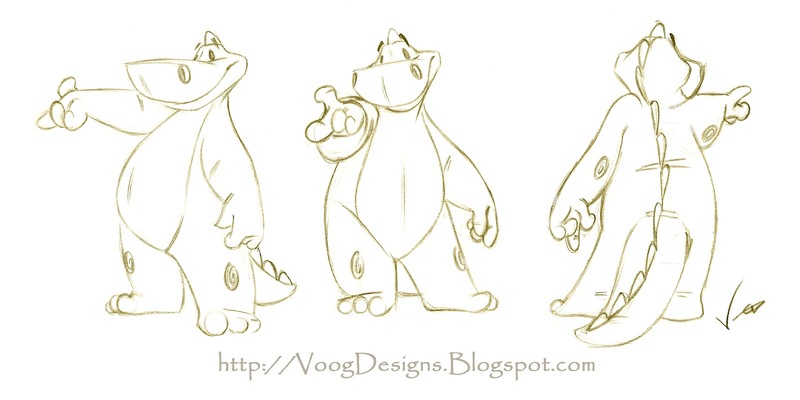 Whenever you are developing your character, it is always a good practice to draw your character in various positions. Try to capture them in different attitudes by focusing on strong silhouettes in their poses like this Lil' Ninja is showing us. Before leaving the house, most of us will take a quick look in the mirror to make sure we aren't missing anything. The same is true for the characters we create. 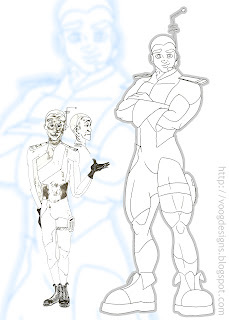 A great exercise when you are creating new characters is to do what is called a "turn-around". Start by drawing your character in an interesting pose. Now imagine that your character is a statue on a rotating platform that you can turn around. What would your character look like from the front? The sides? The Back? How well do you know your character so you can draw them in poses you rarely use? Try it. And if you are having a difficult time drawing the backside, take a little more time to think about the smallest details of your creation so that you aren't missing anything. Wow! 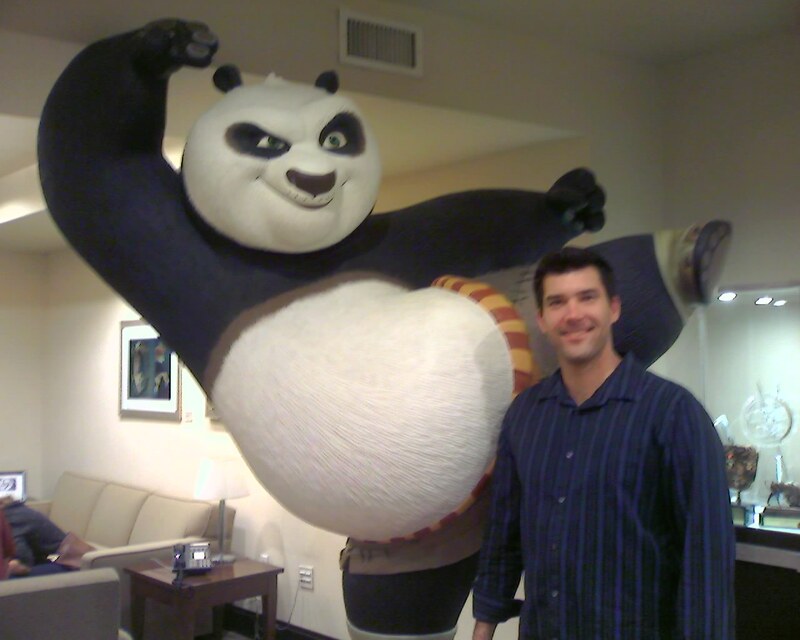 What a great opportunity I had tonight to walk around the campus of DreamWorks Animation Studios in Glendale, CA. I scheduled some time to visit a friend of mine that works there and he was gracious enough to give me a tour of the studios. From seeing detailed plant sculptures (and a life-size Kung Fu Panda sculpture) to running streams and a secret hidden lounge, this campus is certainly a catalyst for creativity. With mission style architecture and ornately landscaped Zen gardens, given the opportunity to work here, I don't think I would ever want to leave! 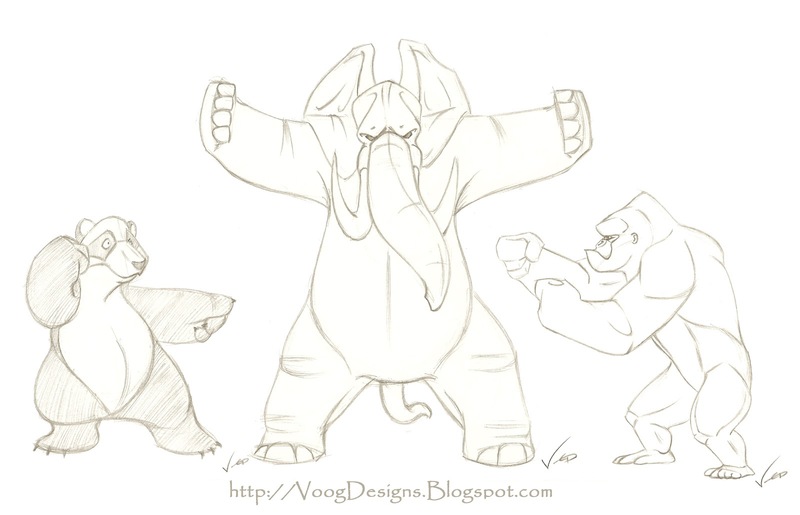 One of the great things about taking human and animal anatomy art classes, is that once you have studied the basic skeletons, muscles and proportions, you can then begin to believably draw animal characters in poses that they would never be able to do in the real world. This exercise not only challenges your imagination, but it helps you to really "flesh out" a character due to your new found knowledge of anatomy. 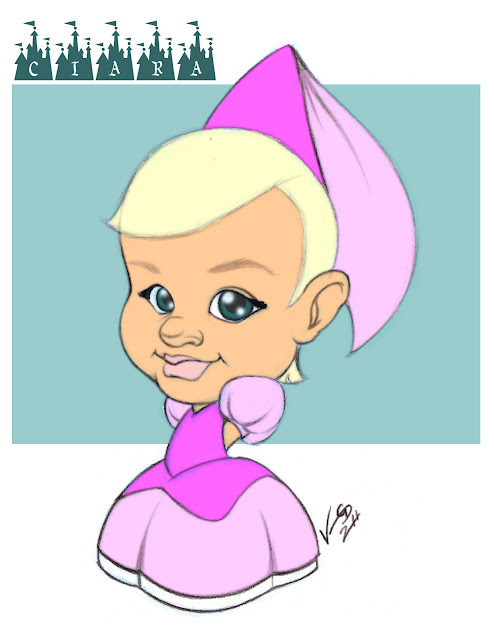 One secret to creating animated characters that are so believable can be found in the lyrics of the old Lloyd Price song, "Personality." Keep this in mind while roughing out your scene, and your drawings will come to life! When I am assigned a project, I always ask the client what design style they are looking for. Disney looks different than Looney Tunes, which looks different than Nickelodeon. Some of my most favorite projects are the ones in which a client allows me the creative freedom to take their idea and adapt it to my particular style of drawing. 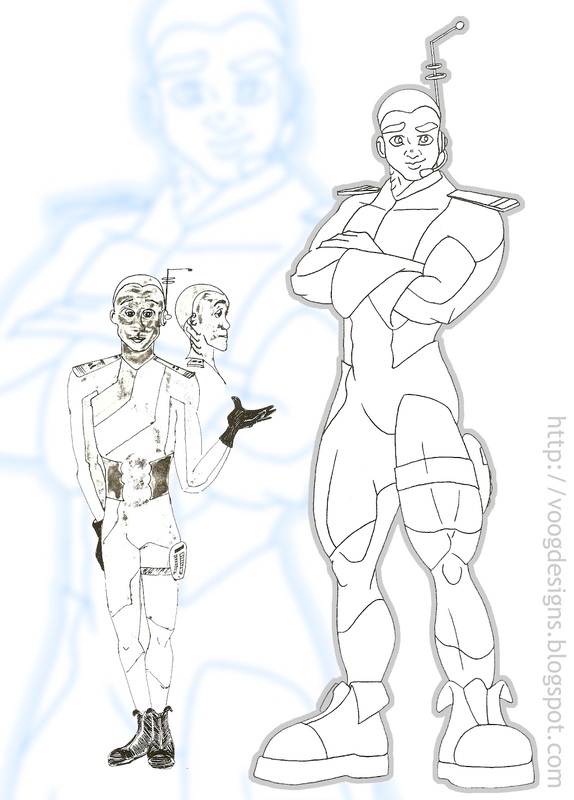 On the left is a drawing of their concept character, and on the right is my design. After working with some great people over the years, you really get to know them and their families. 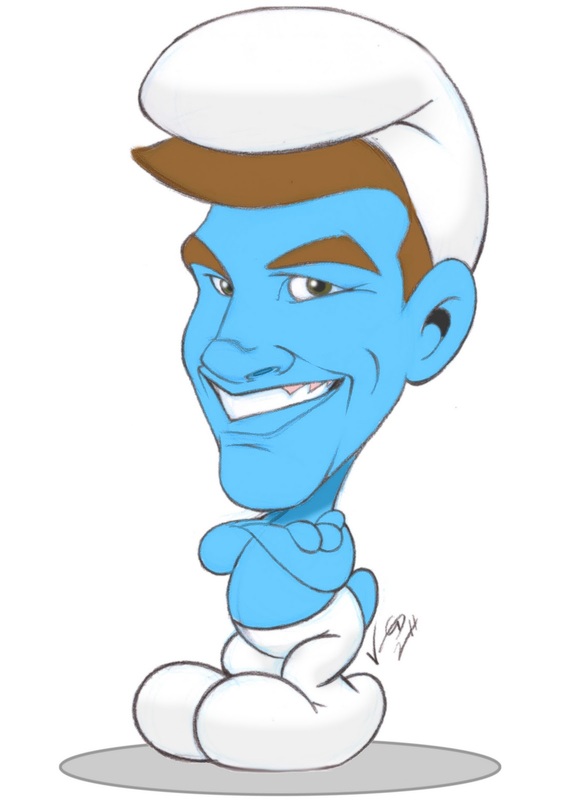 While working as an Account Executive at a "coast to coast" mortgage company, I gave a co-worker this caricature of his son, who at that time loved a certain "space ranger". He's probably 10 or 11 years old now. My daughter loves the movie Cats & Dogs. And although I have always grown up with canine companions, I'm told that they can coexist. Hey, I've seen stranger pairs on AFV! 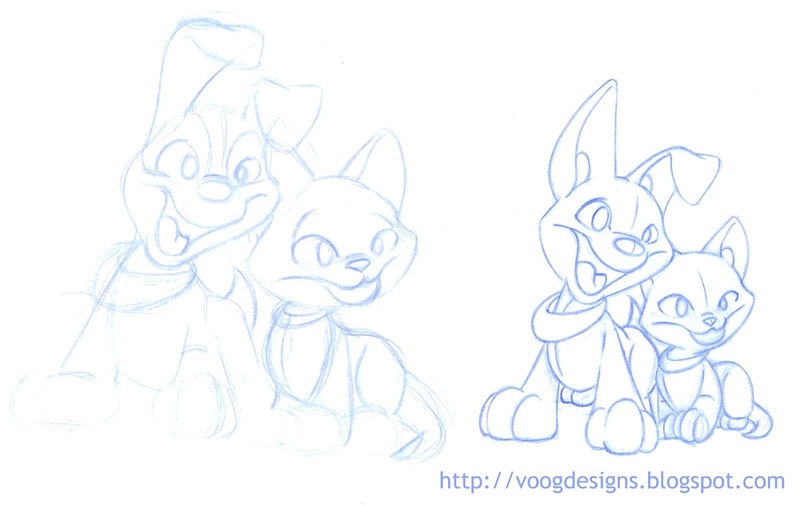 This is a concept sketch of a logo I was designing for a local pet store, which was not used. However, I always attempt to make my drawings esthetically pleasing to look at, and of course with pets, I was going for "cute".